In the last several months we tackled the topic of relationships over rules in the world of students. You can read that post here. This time around, we’re diving into the world of relationships over rules with teachers. As a second year administrator, I (Brent) have a lot still to learn about how to best serve, support and care for teachers. In my 15 months that I’ve served in this capacity, I’ve made my fair share of mistakes. Some small, some not so much. I’ve had staff in the building tell me how much they appreciate my support and encouragement while at the same time unintentionally doing a terrible job of supporting someone the next hallway over. I heard it said recently that students want a supportive, engaging, encouraging environment where they feel known and cared for. I would venture to say adults merely want the same. As an administrator, I (Jeff) get a unique and humbling vantage point into the blood, sweat, and tears that teachers invest every day into the lives of kids. I try to make it my goal to ensure that I am not making the life of a teacher any harder. Sadly, I am certain that there are times I have probably placed an additional burden or expectation on the back of the teacher that caused stress. Our role as campus leaders is not positional, but rather to support teachers to be successful as they are on the front lines for kids and families. The relationships we foster with our teachers are crucial, and in the absence of a relationship all they may see or hear are dos and don’ts from us. Teachers need to hear us say “yes” more than “no.” Our commitment must be to treat our fellow educators as the professionals they are. As we reflect on our practice and the relationships we have with our teachers we must ask, is our end goal compliance or a commitment to high levels of school connectedness and learning. When it comes to our relationships with our teachers we need to separate some fiction from the facts. Fiction: The Administration and teachers are adversaries. Fact: We are all on the home team. We must ensure that failure is never final and that celebrations for one is a win for all. Tip: Teachers tend to react to the tone of the administration well known by the statement, “when the principal sneezes everyone catches a cold.” Let’s extend grace when mistakes are made and be quick to celebrate successes. Take the time to celebrate even the smallest of wins. Fiction: Teachers only care about what happens inside their 4 walls. Fact: Today’s teachers realize that collaboration is the best way for both student learning and their own. Our teachers seek to learn from others in their profession. Additionally, teachers are highly invested in sponsoring clubs, organizations, and caring about kids who aren’t even in their classes. Tip: Teachers need the time to collaborate with other teachers. As the admin we need to fight to protect the time for this to happen whether during the school day or after. How? Let’s make sure we are not making the school calendar so burdensome that we are adding more stress. The goal is less, not more. Fiction: Administrators are just waiting to catch teachers messing up. Fact: Administrators are looking for opps to serve teachers. The goal is not to be the “gotcha” person on campus. The goal is to support teachers at all levels of expertise. Everyone and that means everyone (yes, including us), has room to grow and as admins, you are in the best seat to help support. Tip: Be a coach more than a supervisor. It really is 90/10. Write a quick note or email to share a glow. This will build trust when you need to share a grow, cultivate a growth culture through earned trust. Fact: Teachers are on the front lines with parents. What teachers often need, especially new teachers, is a mentor or an administrator who will walk with them as they build their capacity to make those connections. Tip: Communicating effectively with parents is the stuff they don’t teach in university-level educator programs. Many teachers got into the profession because they love kids but often need some guidance in connecting with parents. Make yourself an available resource to call early and often. Ofter to make the call with that teacher or to coach them through handling a challenging conversation. Fiction: Teachers just want to be left alone so they can teach. Fact: Teachers want administrators who will support them and give them the opportunities and tools for growth. The job of the administrator is to ensure that the teachers are the best that they can be for the students. Tip: There are plenty of teachers doing amazing things for students. There are also some who are not. When they are, encourage them. When they’re not, coach them. Set up 1-minute meetings with all your teachers to do quick checks (consider reading “The New One Minute Manager” by Kenneth Blanchard and Spencer Johnson). Fiction: Administrators are out to get teachers when they visit classrooms. Fact: On target admins will frequent classrooms to witness first-hand the amazing things our students are doing. In doing so, we can encourage teachers and offer support to move from good to great. Tip: Solicit input from your teachers. Seek out what areas they’d like to grow in and where they need your guidance. Oftentimes, a teacher knows where they want to be better. It just takes an outside set of eyes to help them find practical ways to grow where it’s needed most. The single greatest resource on our campus in the pursuit of ensuring that kid’s get the best is not the building, curriculum, or our programs. Simply put…It’s our teachers. We must remember that people don’t leave positions, they leave people. Our commitment should always be to bring out the best in our people. This will put (and keep) our campuses in the position where great teachers are fighting to get in, rather than running to get out. In the end, yes…rules and guidelines need to be in place and adhered to. 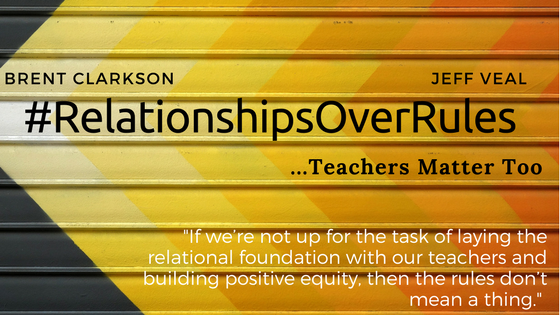 However, if we’re not up for the task of laying the relational foundation with our teachers and building positive equity, then the rules don’t mean a thing.